Emergency Services District No. 25 on the Northside of Houston has started construction of their new, bigger station for Westfield Volunteer Fire Department. The existing fire station located at 4105 Lauder Road near JFK Blvd. will be replaced by a new building across the street. The new station would have 19,800 square feet compared to the existing station with only 5000 to 6000 square feet. “This is going to be the first time we have everything in one spot,” said Turrentine. The Westfield Fire Department serves a 15 square-mile area and provides service to 25,000 residents in a territory bordered by the city of Houston to the south, the Hardy Toll Rd. to the west, Aldine-Bender to the north and US 59 to the East. The Westfield Fire Department operates two stations that protect primarily residential areas. “Last year there were 3, 200 reported fires in our area,” said Turrentine and this year, they almost reached the same number. Fire Chief Maureen Turrentine said there is a possibility to sell the existing building once the new one is completed, and more personnel could be hire or a new truck could be purchased. “There is a crew 24 hours-7 days a week,” said Turrentine. The new building is expected to be open by August of 2011. HARRIS COUNTY—Ten years ago Harris County Sheriff’s Storefront Deputy Grace Luna began saw a need to provide a complete Thanksgiving meal to under privileged children & families that live-in or near District III. Luna took this need, and with the help of others, created Operation Food basket. Through the program Family names are provided to Luna by local schools and Harris County deputies that patrol within the district. “Deputy Luna is a Christian lady with a heart of gold; she provides this on her own free will – it is NOT a part of her “job description”,” said her superior officers with the department. Each year, the Harris County Citizen’s Police Academy Alumni Association (HCSOCPAAA) in District III joins hearts & hands Luna to make this project happen. This year, through the efforts of volunteers, 22 families will be blessed by their efforts. Throughout October and early November the HCSOCPAAA collected non perishable foods amongst its members, to begin the process of fulfilling Food Baskets. 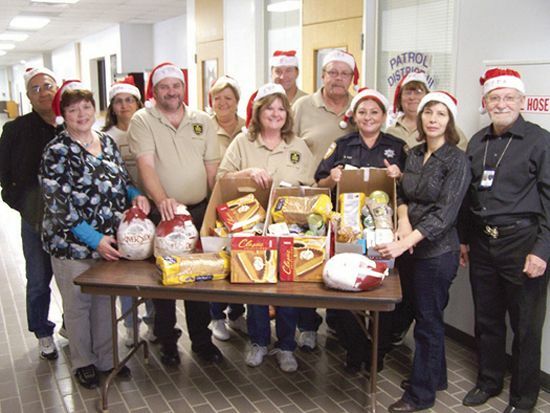 Meals were distributed at the HSCO Wallisville Substation, on Nov. 20. The HCSOCPAAA District III would like to thank everyone that had a hand in making this event such a huge success. Thanks to Deputy Grace Luna, John Rowlett, David & Becky Moon, Tony & Jeri Gonzales, Ramona Ryle, Debbie Gray, Felecia Gokey, Craig & Donne Dass, Ron Deluge, Bernadette Beauchamp, and Mary Morales. If you are interested in joining a great organization that supports your local law enforcement; and enjoys serving your neighborhood, contact the Harris County Sheriff’s Office Community Support Bureau at (281) 647-9371 and ask for the Citizens Police Academy Coordinator. Information will be made available regarding the next CPA class in your area. Together we CAN make a difference. HOUSTON-With the canvassing and certification of the Nov. 2 Board of Trustees election results and the end of the two-year appointment of the Board of Managers, the NFISD Board of Trustees returned to governance of the district in a special meeting held immediately after what was the last meeting of the NFISD Board of Managers. In Oct 2008, TEA Commissioner Robert Scott appointed McShan, Rev. Dr. Willie Jones and Carolyn Bullard-Williams to serve on the Board of Managers after suspending the Board of Trustees for two years. On Monday night, members of the North Forest ISD Board of Trustees thanked them for their service and vowed to continue moving the district forward. McShan’s final official acts as president of Board of Managers included certifying the election results and presiding over the reorganization of the Board of Trustees. Based on the results of the Nov. 2 election, Henry McGowen, who won 4,613 votes to beat his opponent Bullard-Williams in the Position 6 race, and Horace Williams Jr., who garnered 6,768 votes in an uncontested race for Position 7, joined Silvia Brooks Williams, Charles H. Taylor, Sr., Lois Edwards, Thaddeus Seals and Albert Coleman on the Board of Trustees. After their reorganization, which resulted in the election of Coleman as board president, McGowen as board vice-president, Edwards as board secretary, and Horace Williams as assistant secretary, each of the trustees briefly addressed the meeting attendees. Coleman thanked members of the Board of Managers for their service. Superintendent of Schools Dr. Adrain Johnson said he looks forward to working with the Board of Trustees and called the occasion an historic moment that speaks to the strength of North Forest ISD. While local law enforcement has stepped up their presence at the suspected crime-haven Haverstock Hills Apartments, Harris County is moving forward with a never-before tried method to rid the area of crime— civil penalties. Earlier this month Harris County District Attorney Pat Lykos filed a public nuisance lawsuit against 33 “known members” of the Crips and Blood gangs. The temporary injunction prohibits them from congregating in a 57-acre area near Aldine Bender and Lee Road, which includes the 700-unit Haverstock Hills apartment complex. “This is a grand day in Harris County,” DA Pat Lykos announced in a Nov. 10 press conference. Lykos said the apartment facility has become a center of crime and gang activity. She added that through the injunction she hopes to keep gang members out of the area, thereby causing crime to drop. This is the first injunction of its type to be filed in Harris County. Under the injunction, deputies would have the authority to arrest on sight any of those named in the court document, even if they are not in the process of committing another offense. The penalty for violating the injunction, a Class A Misdemeanor, can be up to one year in jail and a $4,000 fine. According to the D.A.’s office a Dec. 10 court date has been set, where the state will present its petition. At that time, the judge has the option of approving the injunction, denying it or setting a second hearing to hear testimony from both sides. While the injunction is the first of its kind in Harris County, other cities have similar anti-gang initiatives. Among these are a 9 p.m. curfew for known gang members, banning known gang members from possessing a cell phone in a vehicle and the prohibiting the wearing of known gang colors. The cities of Bryan, El Paso, Fort Worth and San Antonio have also created “gang safety zones” similar to the one Harris County is proposing. In 2006 San Francisco enacted a “civil gang injunction” targeting five “safety zones.” The City of Oakland soon followed suit. According to the San Francisco City Attorney’s office, they have seen the percentage of identified gang members arrested for non-injunction offenses drop from 41% in 2007 to 14% in 2010. Although challenges to the injunctions have been, appellate courts in Texas and California have upheld the injunctions. The Woodlands Waterway Marriott Hotel was the scene last Thursday night of the Lone Star College System Small Business Advisory Council 24th Annual Awards Banquet. This banquet annually presents five awards, one in each of the System’s service areas, to a premiated small business that exemplifies business and financial success, contributions to their community, recommended by their peers, and a statement from the owner of their desire to be nominated. Over 300 persons attended the banquet, which was emceed by Bennie Lambert of LSC-North Harris. Remarks were made by Chancellor Dr. Richard Carpenter, and Sal Mira, director of the LSC-SBDC. Mira noted that this SBDC was the first of 15 area centers, started in 1985. Last year the center helped over 100 businesses start or improve. This helped create 500 new jobs in the area. There were fifteen finalists, and five winners. From CyFair, Charlie Fogarty of Steamboat House Restaurant won, and the others nominated were Randall Dixon of Energy Capital Credit Union, and Tracey Brundrett and Janine Moore and Darrell Ellisor of Peak Financial Group LLC. From Kingwood, Danell Fields of Danell’s Gifts & Florals won. Others were Drs. Kylle Buchan and Cody McComb of Kingwood Chiropractic Assoc., and Sandra Rogers of Spring Chicken Travel. 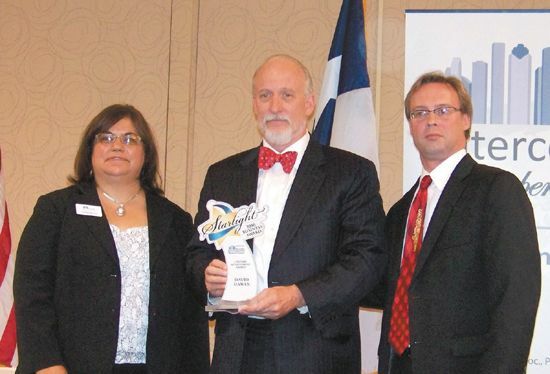 From Montgomery, Bruce Tough and the Tough Law Firm received the award. Other nominees were Lisa and Larry Fleming of Accurate Inspect, and Michelle and Chris O’Rourke of Outback Western Wear. From North Harris, Carol Fellbaum of A Dog’s Life Pet Salon & Boutique won. Others were Dr. Raymond McLendon of ClearChoice Orthodontic Associates, and Zandra Draper and Dr. Alexander Warren of Texas Tutor Professionals. 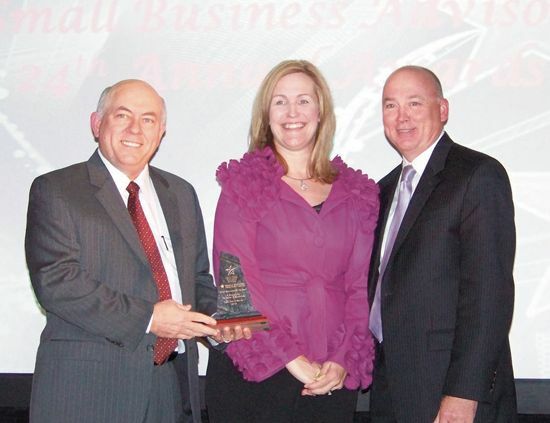 From Tomball, Leanard Courtright of Allied Siding & Windows received the award, and other nominees were Deborah Hroch of Deborah Hroch & Associates, and Tom Tucker of Graco Awards Enterprises. The Major sponsor of the evening was the East Aldine District. Other sponsors included Amegy Bank, CenterPoint Energy, Danell’s Gifts & Florals, East Montgomery CID, Greater Conroe EDC, Houston Airport System, Joiner Partnership, Lone Star Corporate College, and Sunbelt Business Sales & Acquisitions. The Houston Intercontinental Chamber held their annual Starlight Business Awards and installation banquet last Thursday night, and honored a number of companies and persons for their achievements. Jocklynn Keville of the Greenspoint District was sworn in as the new chairman of the board of the Chamber, as well as the installation of the new board for 2011. A special “Lifetime Achievement Award” was presented to David Hawes, founding partner of the Consulting firm Hawes Hill Calderon LLP, who represents the East Aldine District and eight other management districts in their governance. The Gala event was held at the Crowne Plaza hotel in Greenspoint, with about 200 persons attending. The evening included silent and live auctions, awards, and swearing in of the new Chamber board for 2011. The live auction was conducted by Greenspoint president Jack Drake, with lively commentary as well as bidding. Emcee for the evening was Chamber president Reggie Gray, beaming not because of the gala, but because he had been a new father just two days before. Recognition was given in various categories, which are shown on page 8 of this issue. The highlight of the evening was the award to David Hawes for his years of dedicated service to communities in Texas. He has served the population while at the Texas Department of Human Services, as CEO of TCARE, a nonprofit residential treatment service to adolescents, as chief economist in the Lanier Houston administration, and helped form 11 of Houston’s 22 TIRZ zones and administer nine Management districts. Jack Drake swore in Jocklynn Keville as the new Chamber chairperson. The two of them joked about her starting from a humble beginning on a fishing boat in Louisiana, and her “journey” to Houston’s Greenspoint District. Aldine Optimist Club had a special guest at its last meeting on Nov. 10. Sonny Donaldson, retired superintendent of Aldine ISD and now an active member of Kairos Prison Ministry at Hightower Prison in Dayton, explained the functions of this program to help prisioners feel relief and improve themselves, while behind bars. There are two prisons in Dayton, Texas. Hightower is one of them, and is the one the Kairos program assists. Kairos Prison Ministry Program is an international operation that is in many states. “In Texas we have about 155,000 people that are incarcerated,” said Donaldson. These 50 volunteers, or “team members” are supported by another outside team composed of men and women. There is also participation from three inmates who have taken this program in previous years and now they work with the team. With this program prisoners can find support within an environment that has rules and regulations behind bars. Applicants for this program need to fill out an application form and only 42 are selected by Committee. The group of 42 is a diverse group. And every year there are different prisoners who participate in this program. During the three and half days at Hightower, they distribute 25,000 bags of cookies to prisoners, this is called the day of ‘Love Cookies’, they also eat breakfast, lunch and dinner with the prisoners. The Kairos program “has changed the culture for prisoners and guards about relationships and treating people with respect,” said Donaldson. Research have shown that more than 80% of prisoners will be back in prison unless they have experienced the Kairos program or any other type of ministry program. For those who take part in a ministry program, recivitism is less than 20%. If you want to be part of the Kairos team, they are always looking for volunteers. To make donations or support this work, please call Sonny Donaldson at 281-516-9792. 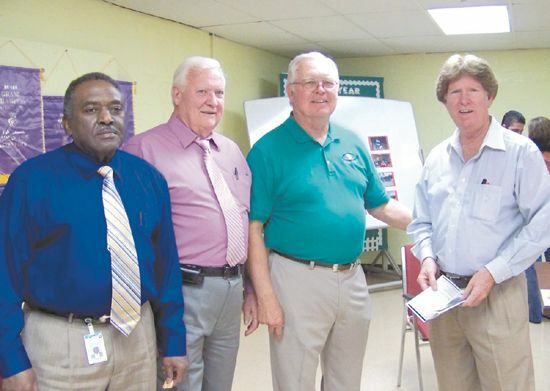 The Airline Improvement District is continuing to move forward with numerous projects. The District has completed the negotiation process and has signed an Advanced Funding Agreement with TXDOT to oversee the mobility projects listed below and is in the process of selecting a consultant to design the projects. These projects were among those listed in a mobility study that was conducted in partnership with the Houston-Galveston Area Council. All projects are subject to final approval from Harris County and final cost assessments. 1. Construct sidewalks on both sides of Airline drive from Gulf Bank Road to Canino Road. 2. Two additional crosswalks in the 8000 block of Airline Drive, one North of the existing crosswalk and one South of the existing crosswalk. 4. Addition of two bus shelters near the 8000 block of Airline Drive. 5. Construct sidewalks on both sides of Aldine Mail Route from Airline Drive to the Hardy Toll Road (final design will be subject to Harris County roadway alignment for the widening of Aldine Mail Route). 6. Construct sidewalks on the North side of Canino Road from Airline Drive to Nordling Road and on the South side of Canino Road from Van Ness Street to Airline Drive. 7. Add east bound left turn lane to Gulf Bank Road at Sweetwater Lane and upgrade signal. 8. Upgrade intersection signal located at Sweetwater Lane at Mount Houston Road. The East Aldine District wants you to know about “Shop East Aldine.” This is a shoppers program that functions as a “Loyalty Card.” The Card does not have ANY COST but as a customer you could take advantage of discounts at participating stores, and as a merchant you will get more customers to your business. To get the “East Aldine Shoppers Card” go to the District Offices at 5202 Aldine Mail Route or at a participating stores. To learn more call the District at 713-595-1220 or visit www.AldineDistrict.org. Next, there is a list of the current participating merchants and their specials on the “East Aldine Shoppers Card” program. -Beasley Tire Service: $25 off Set of 4 Tires. -Northeast News: Free classified ad. Pay for 1 week, get 2nd. week free. -Sarahi’s Beauty Salon: $2 off women’s hair cut. $1 off men’s haircut. -Aldine Y.O.U.T.H. $5 off with purchase of $15 or more. -Jed’s Hardware: 50% off any single item of $25 or less. -Amanda’s Record Shop: SAve when you purchase 3 cd’s $2 off the 1st and 2nd CD, 50% off the 3rd. -Artel Photo & Video:10% off any service. -The Hair Resort: women’s wash & style $5 off new customers only. -Indomable Western Wear: $5 off any purchase. -Hair Salon de Bertha: $2 off haircut. 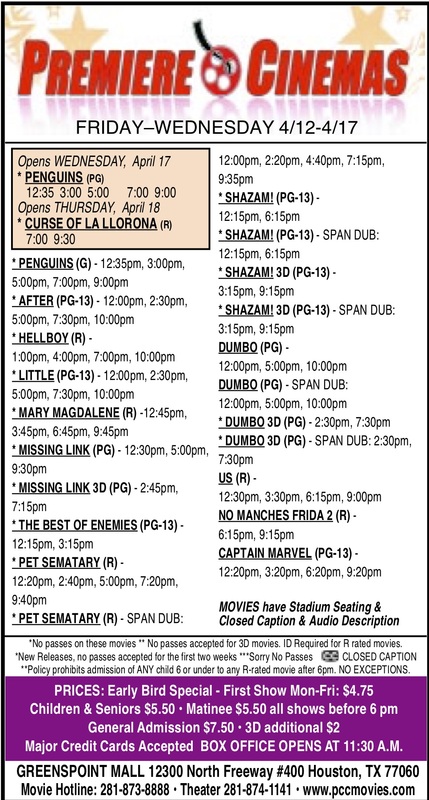 All offers expired December 25, 2010.